Take a stroll through history around the fort and grounds that straddle Hadrian's Wall. 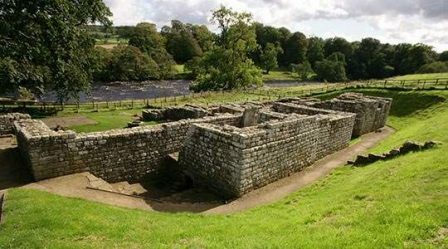 Chesters Roman Fort housed a garrison of 500 cavalry troops here for about 300 years. Today you can still see all four principal gates of the fort, the headquarters building and courtyard, hall and regimental shrine. Plus, don't miss the ruins of an elaborate and luxurious commandant's house. What you see of the fort today is the result of the excavations by John Clayton. His passion for archaeology played a vital role in the preservation of the Roman sites on Hadrian's Wall in the Victorian era. Browse the recently updated Clayton Museum to discover a myriad of Roman finds, and find out about the 'saviour of the Wall', John Clayton. A keen antiquarian, John Clayton (1792-1890), excavated many sites, discovering hundreds of altars, pieces of jewellery and religious artefacts, during his lifetime of excavations along the Wall. These finds are cared for in the museum, which contains some of the most famous items, on behalf of the Trustees of the Clayton Collection. The museum first opened in 1896 and still has many of its original Edwardian display cabinets.